How do I remove a user and a license? 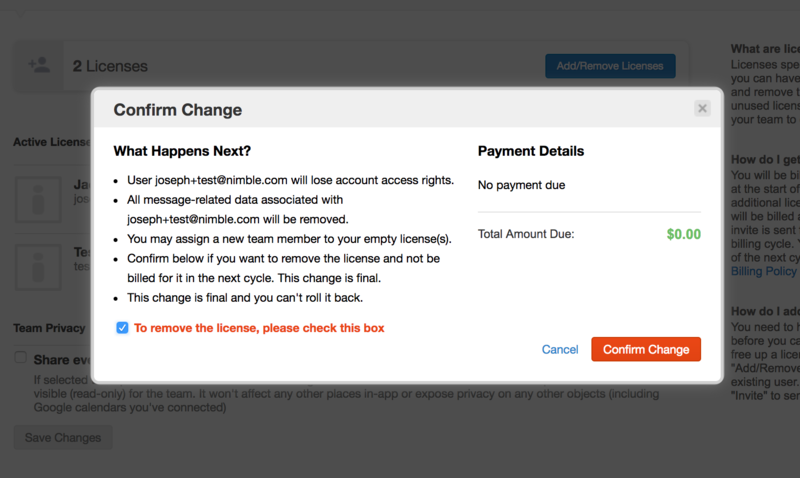 For cases where you are downsizing your Nimble team, take the following steps to remove both a user and a license. In Nimble, go to Settings >> Users and select Remove User next to the team member you wish to remove from the account. To remove the user and license, check the box that reads "To remove the license, please check this box". Please note: If you will be replacing the removed user with a new user immediately, make sure the license removal box is NOT checked before confirming your changes. Then, you can click "Invite Users" again to add the new team member without having to add the license again and incurring an additional payment.